Is there a better alternative to DMG Designs? Is DMG Designs really the best app in File Management category? Will DMG Designs work good on macOS 10.13.4? 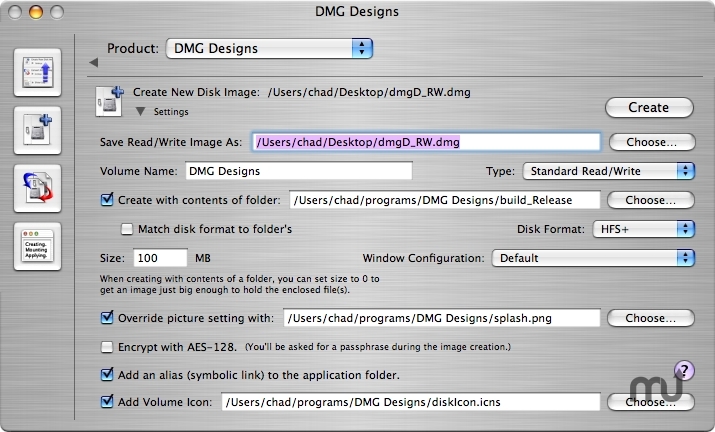 DMG Designs allows you to produce customized disk images (.dmg files). Automatically include files and directories, background images, volume icons, an alias to the application folder, Software License Agreements (SLA), and much more. Now fully compatible with Mac OS X 10.5. A few minor text updates. DMG Designs needs a rating. Be the first to rate this app and get the discussion started! Save groups of settings called "products"; if done, producing an image is as simple as choosing the product and clicking "Create". Create window configurations that can be used with any product with the same options as in the Finder. Each SLA, can have multiple localizations. You can customize the messages in the system window that displays your SLA. You can even create new localizations for the Disk Image Engine! A background image can be correctly hidden and your disk image's window can be automatically resized to the background image. The dmg can be segmented based on size. DMG Designs can automatically calculate a SHA-1 or MD5 checksum on the final image. Enjoyable to use: Change its appearance from standard, textured, built-in skins, or even custom skins! Changes in views are optionally animated.